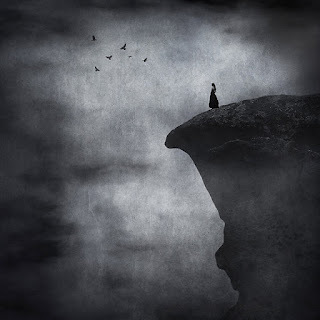 She stood at the edge of the cliff, watching the rocks fall beneath her feet. It was hard to see what was on the other side through the fog. She looked behind her—all that was left of the trees were trunks still smoking and black. She looked down the canyon—left and right—the water rushed through the gorge, the caps were white and she could feel the chaos that churned in their power—each rapid reminding her of the storm that raged inside. At this point she had only two choices: jump—and never have to feel any of the pain ever again—let the water take it all away; or turn around and try hard to find her way through the wreckage— back to the place that took everything from her, alone to pretend life was worth living. Time stopped as she stood at the greatest crossroad of her life. Looking down . . . nothing seemed promising, a fatal steep drop, the easy way out. Looking back . . . a darkened broken picture of what once was. The view of the mess sent chills down her spine and a pit of fear in her stomach. She didn’t want to die, but she no longer could live as if she were dead. Her eyes didn’t know where to turn their gaze, every direction a reminder of her worthlessness. She was not enough. Yes, this was all the evidence she needed—this moment made everything so clear. For the first time in her life she had nowhere to turn, and worse . . . no one by her side. Did anyone care she was alone? Would anyone notice if she wasn’t there? Her life—or her death—wouldn’t effect anyone else, so what did it matter? She wanted to just jump and make it all go away. Each thought and each glance brought about more and more fear. She was frozen, broken . . . and alone—her darkest hour. She thought about her life, each moment leading up to this day—all the broken promises and pain. She thought about her death and wondered if she had already been forgotten. She didn’t know who to be angry with: herself, everyone else . . . maybe God? Soon the fog began to surround her. It was so thick even the canyon view began to grow black—she looked back to more darkness. At the edge of the canyon the world went black and she was surrounded by her fear of being alone—she stood in the darkness battling her demons. Hours passed, each one bringing more and more panic for her need to look down and check behind her. Total darkness, utter isolation. Her eyes began to scan the world for any glimmer of light—and that is when she realized she would have to look up. As her eyes gazed toward heaven she felt a peace unlike any she had ever known. For a few minutes time stood still and she could finally see. Like a movie playing on a screen, she could see herself living a life—her life. She saw a glimpse of light in her eyes, and beauty in her soul. A magnificent love surrounded her and for a split second she knew in her heart that God had a plan. In that moment she could see herself on the other side of the canyon. She was not only living, she was laughing and smiling . . . and she was standing tall. But how could this be? A broken girl, with a broken soul . . . she could never be whole, or loved. She could never be enough. Or could she? With nothing but a glimpse of a promise, she set out on her journey in the dark. She decided she would move forward even if she had to take just one step at a time. For the first time in her life she would live each day with grace, knowing that she could not change the past . . . but she would have a future. She was still stuck in the fog at the edge of a deep canyon, but she was going to live. And that is what she did. Some days she could barely see with so many tears in her eyes; some moments she couldn’t breath with so much pain in her heart, but day-by-day she began to find herself. You see, the angels couldn’t just pick her up and set her down across the canyon . . . but they walked with her through darkness, they battled with her through the valleys and the streams. They showed her the pathways to take and the hurdles to cross, and eventually they helped her find how to become that girl—the one smiling and standing on the other side of the canyon. She saw many miracles in those dark days, but the greatest gift she received was the rocky course—the bumps and the bruises—that taught her how to fight. It isn’t until she hit rock bottom that she realized she was only half way living when she was at the top. Strength came when she had to find—for herself—just how strong she was. That fight is what showed her that she had worth—that she was enough for God. It wasn’t an easy road, or a paved path . . . but she fought every step of the way. And as she looked toward heaven, she was reminded how—not why—her journey was different than the one she had planned, and she knew without a doubt that she was never alone. He was there through that fire, He was standing with her by that raging water, He was catching the pebbles that crumbled under her feet, He felt every pain, He heard every fear, and He wiped every tear. He was always there, but the moment she could finally feel Him . . . was when she decided not to look down, not to look back and wish for what was, but . . . to LOOK UP. This is one of the most beautiful things I've read. Thank you!